With Multi-Collateral Dai on the horizon in 2019, it’s time to take a look at another essential piece of the Dai ecosystem: Oasis. One of the first places for people to buy and trade Dai, Oasis played a huge part in the success of the project to date. But now, with Dai traded on a number of exchanges and DEXs around the world (most recently Coinbase! ), there is an opportunity to re-imagine Oasis to be a more powerful trading solution, especially in a world of Multi-Collateral Dai. Oasis was the first decentralized marketplace on Ethereum and one of the the only DEXs that operates completely on-chain. We are going back to our roots to build something totally innovative and new, just like we did with OasisDEX and Oasis.Direct. On January 31, 2019 we are going to take down the OasisDEX and Oasis.Direct front ends to completely rebuild the solutions based on a new strategic direction. We believe there is a critical need for a place where people can trade Multi-Collateral Dai and the multitude of collateral assets backing Dai, including security tokens, while also conveniently accessing CDP features for all of these assets. That means that we will pursue a new solution that complies fully with applicable global regulations. We are also planning to integrate fiat on-ramps for greater convenience. The new solution will launch after Multi-Collateral Dai goes live and will showcase the full potential of the Multi-Collateral Dai platform. We believe that just like the original OasisDEX was a trailblazer for the DEX ecosystem that eventually developed on Ethereum, the new Oasis will similarly be the first of a new vibrant ecosystem of CDP-enabled, and compliant, security token DEXes. As we all know, the regulatory landscape is ever-changing in the crypto space, so we cannot guarantee when the new site will be live. What we will do, however, is provide regular updates on our progress and share an estimated go-live date when we have more clarity. Oasis has always been a critical part of the Dai ecosystem and we want to sincerely thank all of the folks who used and supported us to this point. There is a bright future ahead for Oasis and we look forward to having you join us when we get there. On the same day as oasisdex.com and oasis.direct halt operation, a new marketplace by the Oasis team will launch: eth2dai.com. This is a decentralized trading solution that is optimized for the simplest possible user experience and will contribute to ETH/DAI liquidity alongside the many other exchanges that support Dai. 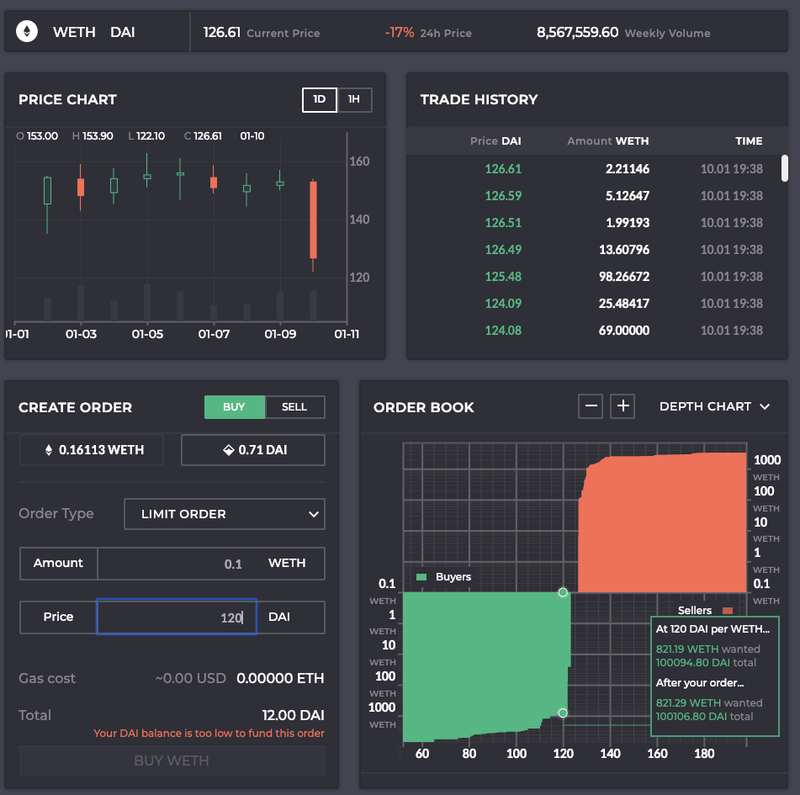 Apart from the new user-interface that includes new price and interactive depth charts, eth2dai will allow for placing two different order types, a regular limit order and a new fill-or-kill order with a user-specified price slippage threshold limit. While oasisdex.com was an important place for MKR liquidity and price discovery, we believe that decentralizing trading of this asset to other exchanges will have a long term positive benefit for liquidity and resilience of the ecosystem. With Oasis halting its operations, we expect new market makers will step-in on the other exchanges that support MKR and create a better trading experience for everyone, further enhancing the decentralization of MakerDAO and its ecosystem.